In just under month Germany, Europe's most powerful country, will hold federal elections, though it appears it will do so without the same level of fanfare and media scrutiny as its neighbors who held elections earlier this year. Opinion polls have incumbent Angela Merkel's CDU firmly ahead of challenger Martin Schulz's SPD, and the main intrigue seems to be which minor party, the liberal FDP or the Greens, will join in the governing coalition. Commentators on both sides of the Atlantic have decried the quiet election season, claiming Germany is glossing over significant societal and economic questions whose impact will be felt across Europe, and the world. 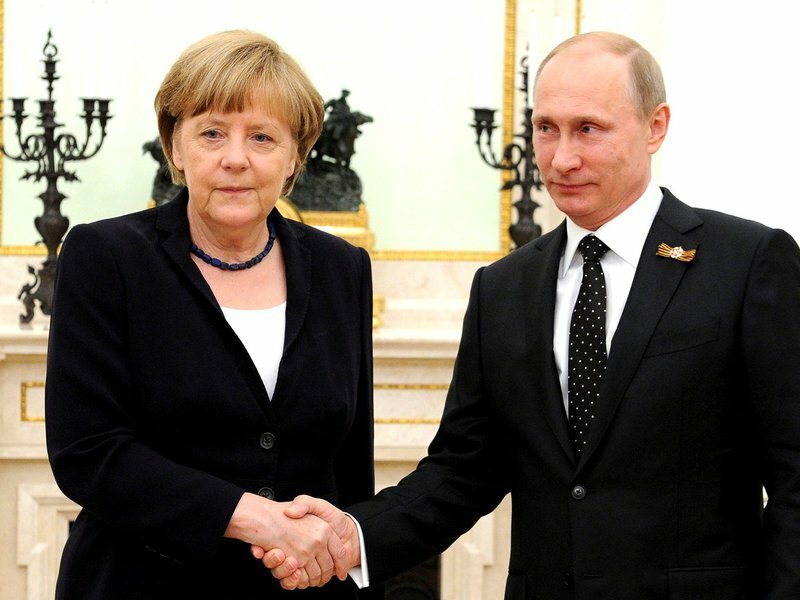 That Germany will sleepily stumble towards the vote on 24th September is taken as a given. The problem is that it is most likely not true. 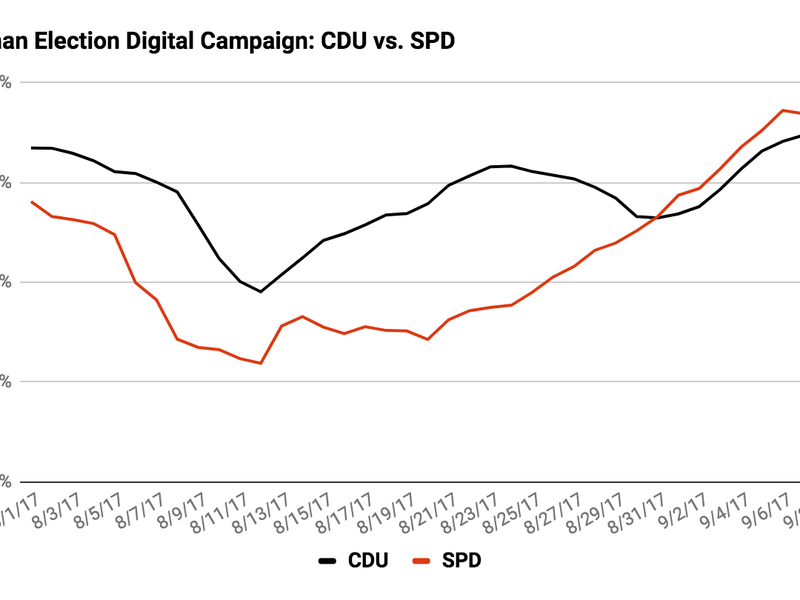 Predata's measures of digital conversation activity point to a rebound in Germany, that will result in a healthily active final month of the campaign season. 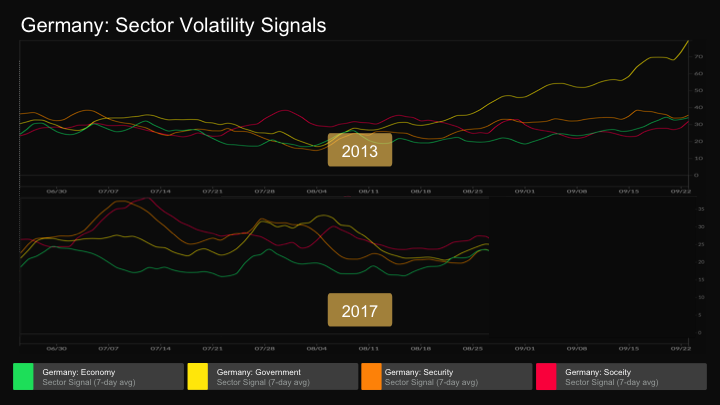 Signals for volatility in Germany are following a similar pattern to those for the Netherlands ahead of their election in March, where the level of digital activity exceeded what we saw ahead of their previous election in 2012. Unlike what we saw in France and the UK, the election debate appears to have permeated across all major sectors of digital activity, rather than concentrating around more abstract issues such as identity and security. 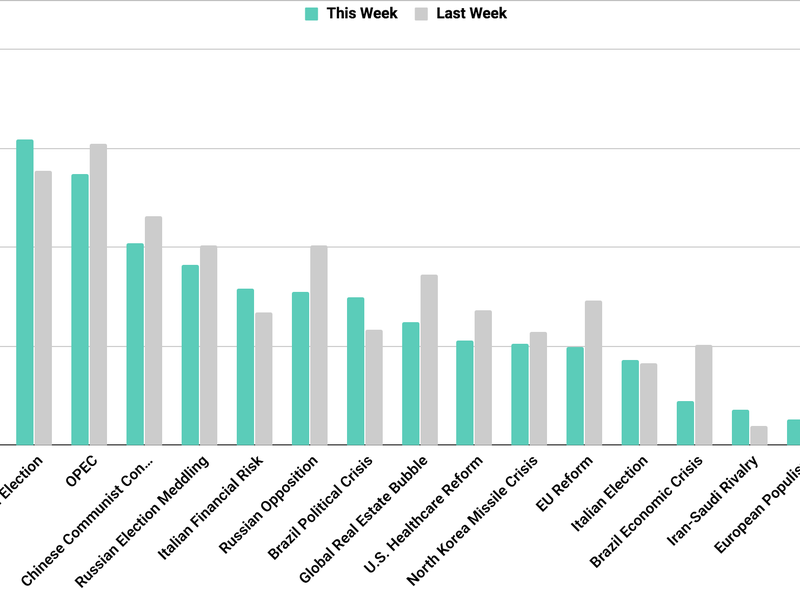 Predata's country volatility signals–calculated on the basis of trending digital conversation activity across several key domains–offer a historically stable benchmark to compare the most recent elections in Europe to the previous one. 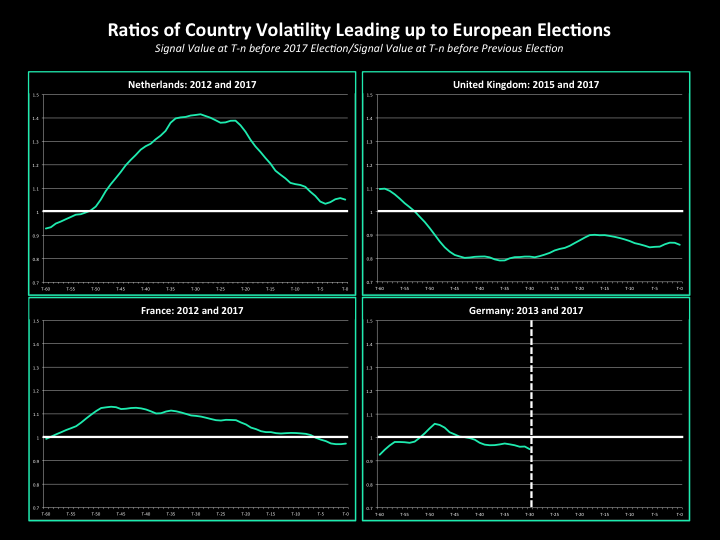 In the figure below, for the Netherlands, France, the UK, and Germany, we calculated the ratio between the country volatility signal in 2017 and at the same point before the country's previous election. When the graph is above the bold white line, volatility at that point in 2017 is higher than it was before, below it and volatility is lower. Each country has experienced a different arc to its campaign season, though in the completed elections in the Netherlands, France, and the UK, a basic pattern emerges: as the day of the vote approached, volatility levels moved closer to where they were around the time of the previous election. Over the past three weeks, Germany's ratio has trended downwards, dipping below the pace of the 2013 election. While there is some reason to believe we should expect to see a similar reversion as the day of the German vote approaches, further investigation is required to determine what form, if any, it will take. 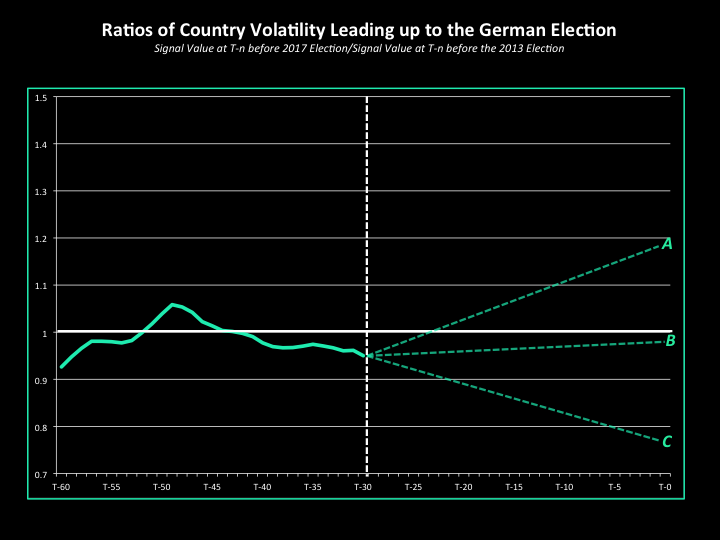 We'll go through each country in turn to tease out any trends in the components behind the country volatility signals, concluding with our assessment of what we expect for Germany. The 2017 campaign in the Netherlands got off to much faster start in 2017 than in 2012, as Dutch voters were confronted with an overwhelming number of parties to choose from. Though the gap did narrow as the day of the vote neared, the Netherlands is alone amongst its neighbors in having a higher level of volatility on election day 2017 than in its previous election. 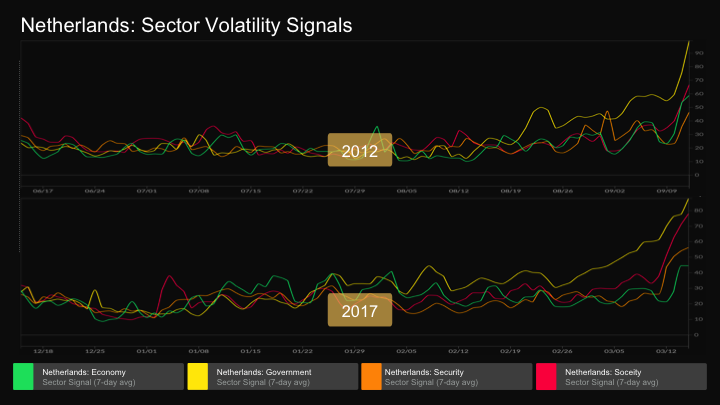 Even though the Government sector was the most active, volatility in the Netherlands increased sharply across all major areas, a sign that the election permeated through all major social, economic, and security questions under debate in the election. Like the Netherlands, France also got off to a fast start compared to its previous election in 2012. 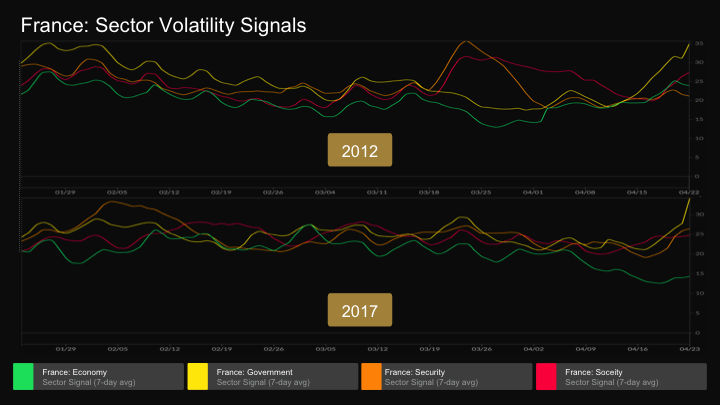 However, beginning about 40 days before the vote the ratio began to fall, bringing the level of country volatility in France on election day 2017 below where was in 2017. Activity across all of the component sectors actually decreased over the final month of campaigning, and when things did rebound, the Economy sector signal remained relatively low. The dominance of the Security and Society signals points to a campaign that was largely waged in terms of identity and under the specter of a growing terrorist threat. Economic issues, by contrast, are more pertinent to the daily life of ordinary French people, who appeared to be disengaged both digitally and in the voting booth. Unlike its neighbors, the UK was not expected to vote in 2017. That all changed in April when PM Theresa May called a snap election to consolidate her party's grip over parliament, a move that largely backfired. 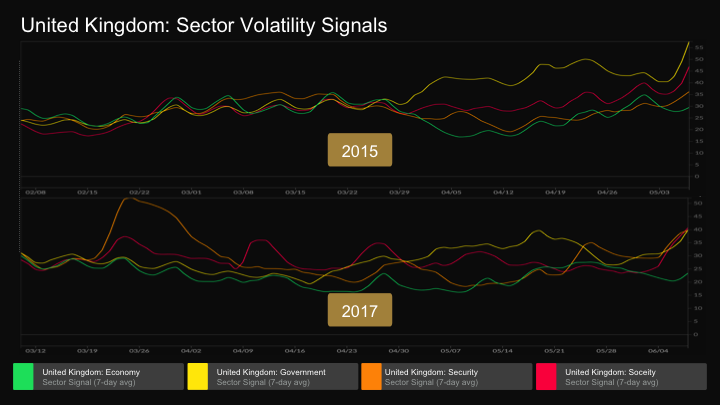 The UK's country volatility signals remained well below their levels ahead of the 2015 general election throughout the short 2017 campaign season, a sign that UK voters were caught by surprise, not prepared to mobilize ahead of the unexpected election. 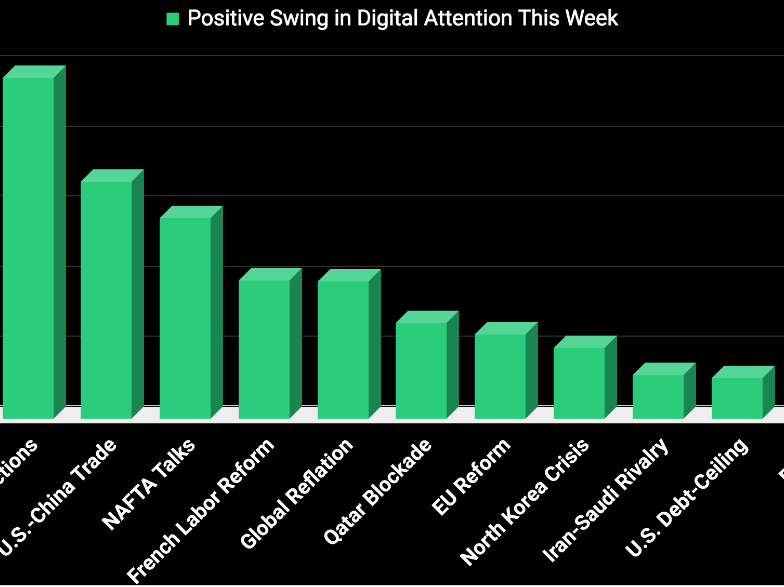 May's failure to steer the campaign towards economic issues becomes readily apparent in the digital domain, as the Economy sector was consistently the least active in the weeks leading up to the vote. The only sector to show high levels of activity was Security, which rose in response to attacks in London and Manchester in March and May respectively. What was the differentiating factor between the Netherlands, which experienced a greater level of volatility in its 2017 election than its previous one, and France and the UK, which did not? In the Netherlands, the pre-election buildup permeated across all sectors of digital activity, whereas in France and the UK, activity was concentrated in just a few areas. In both cases, the Economy sector was the laggard, a sign that both campaigns were marred in higher-level debates on identity and security rather than the more concrete issues that have impact on voters' daily lives. 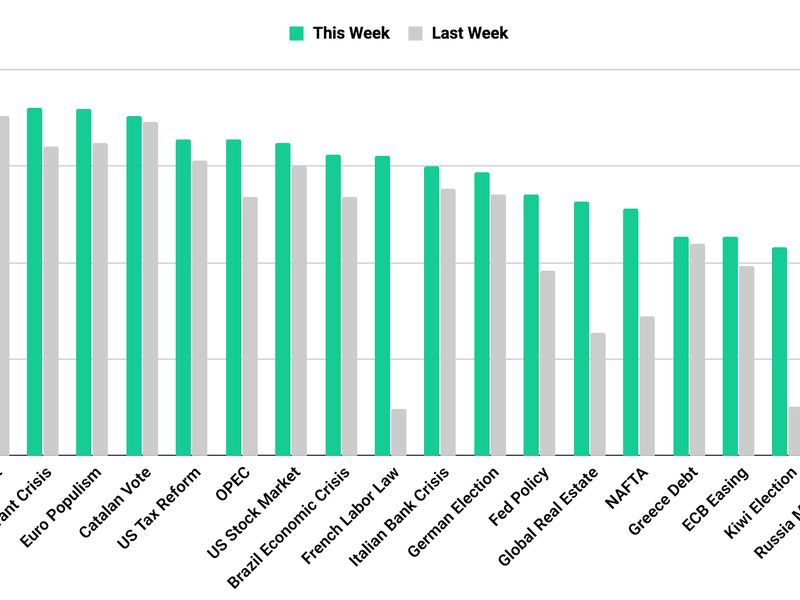 As stated at the outset, over the past two weeks country volatility in Germany has dipped below the pace of where it was at ahead of its previous federal elections in 2013. Based on what we observed earlier this year in neighboring countries, we foresee three possible scenarios for what will happen in Germany as election day nears: A, a sharp increase relative to 2013; B, a steady reversion towards the 2013 pace; and C, a continued decline relative to 2013. Scenario A is by far the least likely: Germany would require a significant shock such as a major terrorist attack or economic crisis in Southern Europe to lift volatility levels that high above where they were in 2013. 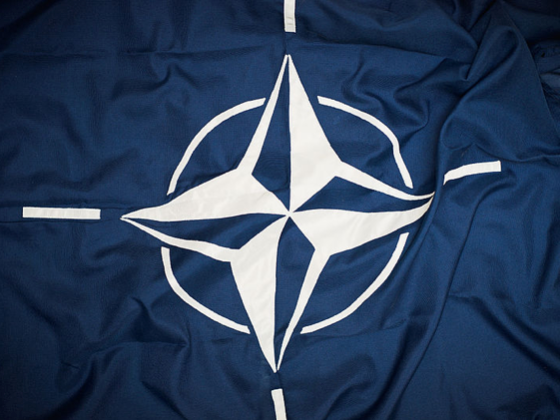 Given recent events in Spain, France, and Belgium, such an event is not entirely out of the question, and the evolution of the sector signals would reveal the extent to which it would have an effect on the outcome of the vote. Scenario C is consistent with the 'quiet' campaign decried by critics and taken at this point as a given amongst close observers. 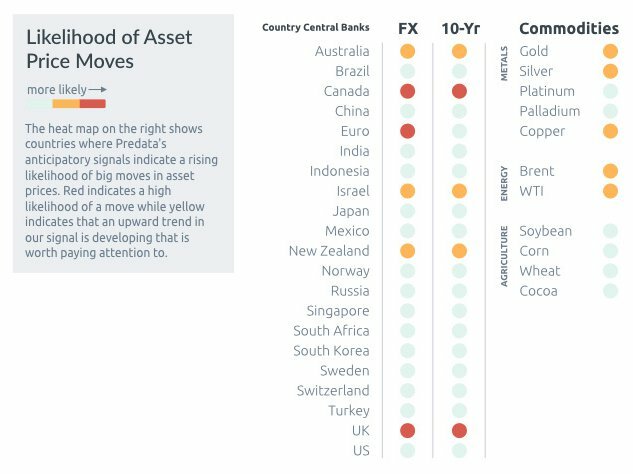 If Germany were to follow this path, it would be in a similar situation to France and the UK ahead of their recent elections, where country volatility is both below prior levels and only driven by a handful of sectors of activity. Scenario B, the reversal of the current downward trend and reversion to the 2013 pace, would put Germany in a closer position to the Netherlands, where country volatility was pushed up by activity across all sectors. In the past week, Germany's sector signals seem to have begun their pre-election buildup, the inflection point occurring at a similar point as it did in 2013. Like in the Netherlands, all sector signals have increased, roughly by the same magnitude. Should the trend hold over the final month of campaigning, it would point to an election that is galvanizing digital activity across all areas, signaling an extensive national debate and a healthily active campaign season. 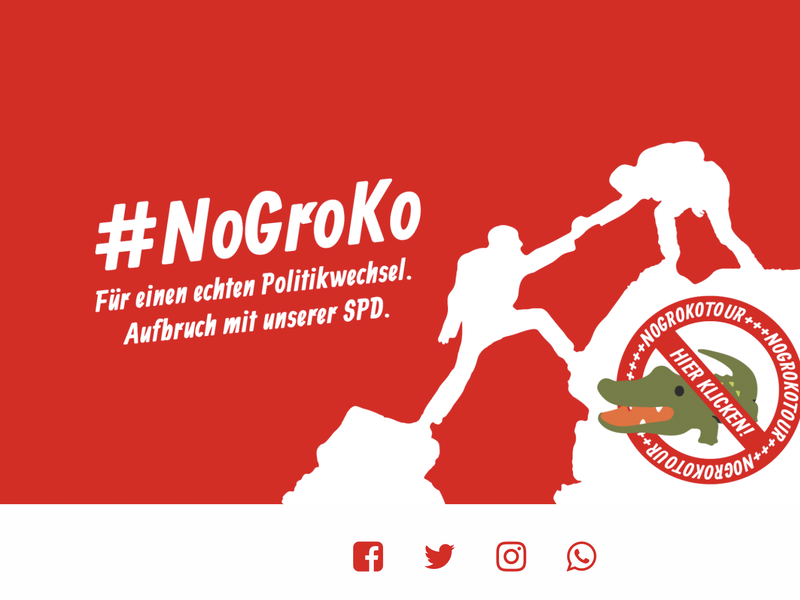 We therefore expect Germany to wake up from the sleepy outset of its campaign, giving its critics and citizens the lively democratic debate they deserve. A livelier than expected campaign in Germany puts more pressure on Merkel's administration to show deference to opponents on domestically controversial European policy issues such as euro area integration and migration. Even if Merkel prevails as expected, her main opponent Martin Schulz will spend much of the next month positioning himself as a key ally of French president Emmanuel Macron's ambitions for euro area reform, calling for an integrated budget, a dedicated finance minister, and a more investment–as opposed to austerity–oriented approach. Especially if potential coalition partners the FDP or the Greens take a similar tack, Merkel will be in a position to outweigh hardliners in her party and pursue a real compromise on EU reform. Schulz has also distanced himself from Merkel's refugee policy, seen domestically as a low-point for Merkel's chancellorship. Europe's collective response to the migration crisis will come to the forefront again over the coming months, as legal challenges to resettlement arrangements work their way through the EU system. Under stronger domestic pressure for her initially welcoming policy stance, Merkel may be more willing to compromise with Central and Eastern European holdouts, to the detriment of refugee hotspots in Greece and Italy.